The banking sector in India has evolved itself extensively by incorporating technologically advanced services such as cloud computing and self-service kiosks. This has not only allowed the sector to enhance the efficiency and quality of its services, but also helped financial corporations save a considerable amount of money. In fact, according to a report by Juniper Research, banks could save up to $11 billion per year by embracing technological innovations. One of the most cutting-edge technologies being utilized by banks today are virtual assistants. These virtual assistants or chatbots, currently at an experimental stage, can automate several processes to drive increased convenience of operation to financial institutions. Through their exceptional services in the customer care domain, chatbots, powered by AI and machine learning, can attract and retain customers with great efficiency. 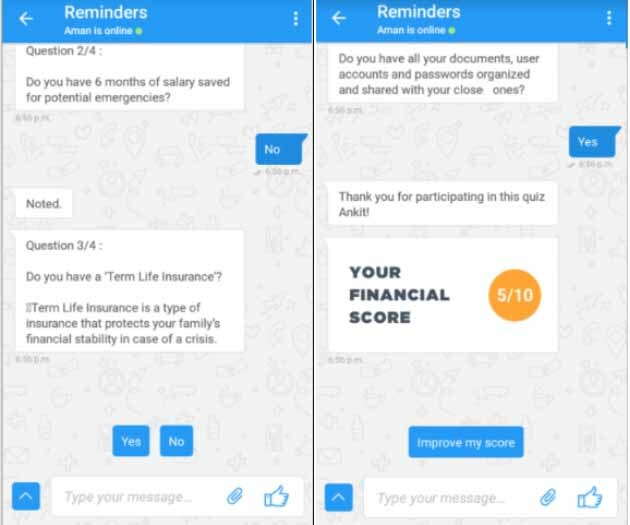 Offer meticulous financial planning: India’s first insurance chatbot was recently launched. This chatbot offers sound financial advice, assisting users who need help choosing life insurance plans and solutions. Virtual assistants have access to customer data such as their personal profiles or life events. Based on this information, they offer extremely personalized advice in tune with their specific needs. Essentially, they aid customers in making smarter decisions pertaining to their finances. In case of an escalation beyond basic queries, these chatbots can swiftly connect customers to human executives for a uniquely seamless experience. While interacting with customers, chatbots can also identify their spending habits, calculate credit scores, create budgets and offer the customer insights into their spending habits and tips towards improved money management. Time efficient: Chatbots offer quick and immediate services to customers, eliminating the frustrating wait to get connected to a human agent, which is currently the case at most customer care call centers. By utilizing technologies such as natural language processing and exceptional computing capabilities, chatbots respond to customers just like human agents would, but in a more efficient and effective manner. These bots function perfectly even during peak times with heavy call traffic, and close queries in record time. Chatbots can be deployed across platforms such as Facebook, Whatsapp and Twitter, to cater to millions of social media users. All customers need to do is state their query and they receive a set of instructions to solve their problems over chat or are redirected to someone who can offer the required information. Banks looking to increase the number of resolved queries per day can benefit greatly from chatbots which help both banks and customers save time. Remove the need for physical presence: Chatbots have transformed banking services by doing away with the need to physically visit banks in order to avail services such as credit cards and KYC updation along with accessing information about new services and schemes. AI-enabled chatbots can provide all these services and related information through quick voice calls or text-chats. Apart from answering questions, chatbots integrated with apps or websites of banks can also identify customer needs and offer services that they are more likely to purchase. Research suggests that brands can increase lead generation by a massive 600% by sidestepping traditional mechanisms and utilizing chatbots. With chatbots handling routine tasks like answering common customer queries, bank employees can focus on other advanced issues that require human attention. Work round the clock: Chatbots do not need to take breaks as they don’t experience fatigue. On the contrary, they work round the clock and provide help to customers even at odd hours. Chatbots continue to work on weekends and public holidays, allowing customers to solve their queries as soon as possible. Banks experience increased customer retention and satisfaction with close to no down time thanks to chatbots. Banking services are now more accessible and convenient as chatbots are available to assist customers 24X7, 365 days a year. Significantly reduce chances of fraud: Chatbots integrated with top-notch AI capabilities, can monitor activities such as card swipes, money transfer and money withdrawal. Through this information about customers, chatbots can efficiently document activities across thousands of bank accounts on a real time basis. One such example is the chatbot incorporated by Visa Canada with the sole purpose of detecting documentation fraud and other malpractices by customers. This is an extremely important step towards protecting banks and their customers from potential losses due to fraud. The advancement of technology, open source data and computational power has bolstered the capabilities of AI-powered chatbots. These chatbots can understand customer’s needs and offer solutions tailor made to these needs. Currently, chatbots are only being used to handle basic queries, but since technology is constantly evolving, these virtual assistants will soon be able to handle more complicated queries and further reduce the need for human intervention. Further down the line, chatbots will be able to integrate themselves with virtual home assistants, making it possible for customers to directly ask questions and receive information through their home device. In fact, some top financial institutions have already integrated their AI-based chatbots with Google Assistant, giving easy access to millions of Android device and Google Home users. So, customers do not even have to type out their queries to get answers. All they need to do is talk into their phones or Google Home devices and get all the information they require in a matter of seconds. All these enhancements significantly improve customer experience at every stage and enhance the bank’s standing by garnering positive feedback. Millennial customers have been frustrated with the antediluvian banking methods that they have been subjected to for a long time. The introduction of chatbots is like a breath of fresh air for these customers who will now enjoy the swift working of technologically-led mechanisms that operate at lightning speed and offer a simple and friction-free banking experience.